Daniel Costa observes an albatross in the Galapagos Islands. Photo by Frans Lanting. Daniel Costa has been studying how elephant seals, whales, and other marine animals interact with their watery environment since he started his graduate work at UC Santa Cruz in 1974. Now a professor of ecology and evolutionary biology at UCSC, Costa is a leading authority on marine mammals, seabirds, and the impacts of humans on marine environments. His appointment this year to UCSC's Ida Benson Lynn Endowed Chair in Ocean Health recognizes Costa's important contributions in these areas and provides support for his research and related activities. Costa said he plans to use the funds from the endowed chair to support graduate students and to expand his public outreach efforts at the Seymour Marine Discovery Center at UCSC's Long Marine Laboratory. 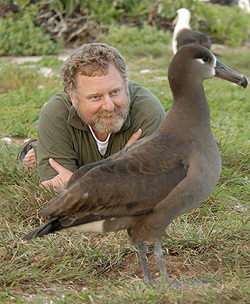 His work with albatrosses, elephant seals, and other "charismatic megafauna" has frequently drawn the attention of the public and the media. "I find it increasingly important to find ways of communicating our research to the public," he said. Costa has used funds from his research grants to help develop new displays at the Seymour Center, including a "Dynamic Planet" display that projects the movements of elephant seals and sooty shearwaters onto a translucent globe of the Earth. With funds from the Ocean Health chair, he plans to develop a display focusing on albatross research, including tracks of albatross flights on the Dynamic Planet and videos describing the research. "The idea is to assist in the development of displays and videos at the Seymour Center that will be modified or updated each year of the endowment," he said. Most of Costa's current research focuses on how marine mammals and seabirds seek and find food. In particular, he is interested in how the foraging behavior and success of these animals depends on climate-driven oceanographic processes, such as coastal upwelling and shifting boundaries between warm and cold masses of ocean water. These studies are critically important for understanding how climate change will affect populations of marine mammals and seabirds, Costa said. "Marine predators rely on ocean processes to concentrate their prey in a predictable way," he said. "But we don't understand how these processes are linked with foraging behavior, or what changes might happen as a result of human influences on the ocean environment." Costa has been a pioneer in the use of electronic tags to track the movements of marine animals. He and his collaborators have developed tags for elephant seals and other marine mammals that not only track their movements but also gather oceanographic data and send the information back to researchers via satellites. This work has been especially valuable in obtaining water temperatures in the Southern Ocean near the Wilkins Ice Shelf on the Antarctic Peninsula, part of which broke off earlier this year as a result of the warming climate. "Our seals have been collecting temperature and salinity profiles in the immediate vicinity of the Wilkins Ice Shelf since 2005," Costa said. In 2000, Costa joined Barbara Block of Stanford University and others to establish the Tagging of Pacific Predators (TOPP) program, which has been gathering data from 23 top marine predators to document their movements and predict habitat changes due to climate change. Costa directs the marine mammal and seabird portions of the TOPP program. Researchers tag animals with temporary electronic devices that gather information on animal movements and habitat use, as well as oceanographic data. "Studies like these are essential," Costa said. "This information will allow us to protect important marine organisms, and it will enable us to differentiate human-induced changes from natural variations in the marine environment." The Ida Benson Lynn Endowed Chair in Ocean Health was established in 1998 and is intended for an outstanding scholar with research interests in the area of ocean health. Costa's five-year appointment to the chair includes $25,000 per year to support teaching, research, outreach, and graduate fellowships. He is the third faculty member to hold the chair, succeeding Kenneth Bruland, professor of ocean sciences. Costa received his B.A. in biology from UCLA and his Ph.D. in zoology from UCSC. He then worked for five years as a postdoctoral scholar at the Scripps Institution of Oceanography. He joined the UCSC faculty in 1991. A fellow of the California Academy of Sciences, Costa has been a visiting scholar at the British Antarctic Survey and the Max Planck Institute for Behavioral Physiology and was the first Zoologist in Residence at the University of Tasmania in Australia. In 2006, the Costa Spur in Antarctica, a promontory in the Ross Sea, was named in recognition of his contributions to Antarctic research. Note to reporters: You may contact Daniel Costa at (831) 459-2786 or costa@biology.ucsc.edu.